Long a nation of scholars, musicians, writers, and patrons of the arts, Austria not only developed a rich culture; it has also produced a number of very fine magicians. Perhaps a lesser known but nevertheless skillful performer in the history of magic was Louis Haselmayer, born in Vienna on September 18, 1838. He was orphaned at age 7 but an uncle saw to his careful education by attending the ‘Realschulle’ where young Louis distinguished himself in physics, chemistry, and drawing. He showed an aptitude for things mechanical from an early age and later trained as a mechanic. His training led to a position with the Imperial Royal Telegraph in Vienna. He also had a great talent for music and studied piano and other instruments at the Vienna Academy of Music. With many magicians constantly visiting Vienna, Haselmayer developed a deep interest in magic and while still a student, built a number of pieces of magical apparatus. By age 18 he was giving regular magic performances for Viennese society and even performed for Emperor Franz Joseph. It was the grand master magician Dr Johann Hofzinzer who gave Hasselmayer the final polish. As well as magic Louis had a strange fascination for canaries and white mice and with long patience and skill he succeeded in training these little creatures in a range of various tricks. This attracted great admiration and complete astonishment. 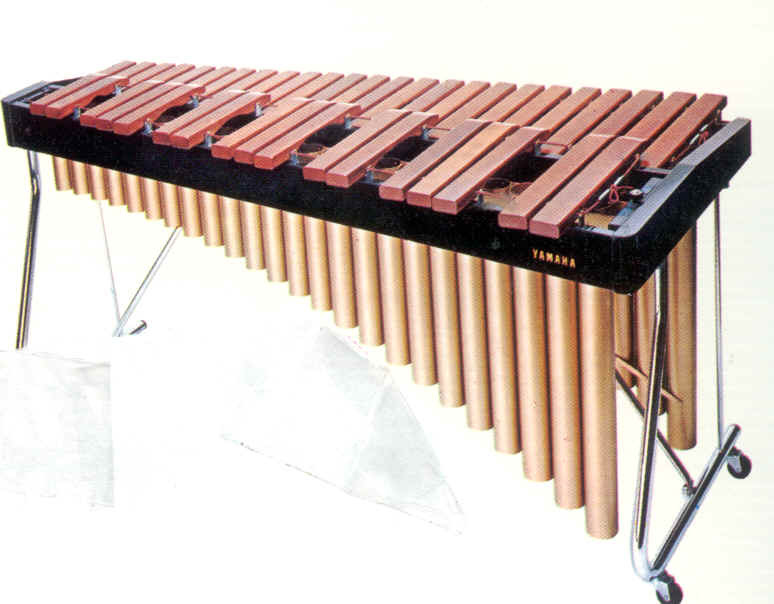 He even invented the strange musical instrument called the ‘Stylocarfe’, now known as the Xylophone. With these added attractions he decided to go on tour throughout Europe. By 1860 he was in England and receiving enthusiastic reviews, notably for his magic, birds and little creatures act. After the musical interlude on the Stylocarfe (that he composed) His grand finale was ‘The Wonderful Portfolio’. While only an inch thick, Hasselmayer produced dozens of caricatures of the local celebrities, two cages of canaries, three ducks, a couple of guinea pigs, a number of assorted coloured boxes, and dozens of metal drinking cups. This was followed by a baby, cradle, and ten large illuminated lanterns each depicting a letter of his name that he strung across the stage. Lastly a little girl aged about 6 would make her appearance from the portfolio. This effect alone was a masterpiece of showmanship and theatrical wonder at the time. In 1867, Hasselmayer returned to Vienna just at the time Professor Compars Herrmann the famed illusionist was preparing for a tour of America. 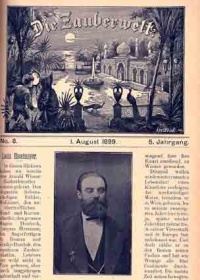 Herrmann seeing Hasslemayer’s show persuaded him to join him as an added attraction. Unfortunately the partnership ended disastrously when Herrmann realised that Louis was a dangerous rival to his popularity and began to treat him badly, often holding back payments. In the end Louis tore up his contract and left Herrmann. With his limited English he struggled to find work and eventually found himself in dire financial straits. Then he met a countryman who recognised Hasslemayer’s talents and skills and promised him great financial rewards as his business manager. He offered to guide Louis on a tour of the United States. This countryman was non-other than the well-known at the time magic dealer Francis Martinka who for many years ran a magic store in New York City and was well know by the magic fraternity worldwide. Martinka assembled a large programme that consisted of magic, music, the trained canaries and mice, and later illusions. They also featured ‘Geissler Tubes’ an electrical novelty and fascinating attraction that were the forerunners to the fluorescent tube. Martinka had planned well, as the show that toured for 5 years was a huge artistic and financial success. During Haslemayer’s American tour he performed at the White house for President Johnson in May 21st of 1868. Then on May 22nd he performed for the Presidents family and senators at the National Theatre in Washington. The Academy of Music of San Francisco conferred the title of Professor of Musical Sciences on Haselmayer. During this period he received a number of special awards and citations as a performer of great talent who managed to include such a variety of different skills into his show. In 1871 he undertook a trip to Australasia and on the way was persuaded to stop off in Hawaii where he performed for the royal family in Honolulu who attended 15 of his performances. The stop over delayed his eventual arrival in New Zealand where he began his tour at the Prince of Wales Theatre in Auckland in 1872. All his bookings in New Zealand were hugely successful with a 4 week extended run in Christchurch. Eventually he arrived in Adelaide where he was presented with a gold medallion specially minted for him. Then in Brisbane he gave 40 consecutive performances. 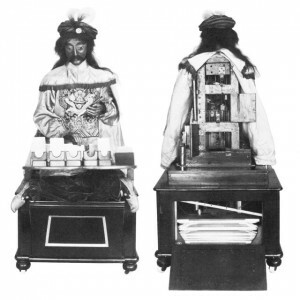 In Melbourne he presented for the first time the famous card playing automaton ‘Psycho’. He also gave charity performances in all the major Australian cities. With so many years traveling he was beginning to feel homesick for Austria, so in 1876 he quite suddenly packed everything up and sailed for home via Cape Town. South Africa intrigued him and he vowed to himself that one day he would like to return to perform there. Once back in Vienna he purchased a luxury villa in a fashionable district that he developed into a comfortable home. His wife had patiently waited for his return after 10 years touring and they settled into their new home. His young wife had stipulated that her husband must never undertake another trip. 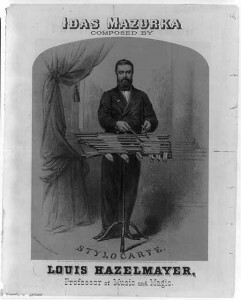 Haselmayer packed his equipment away but his wife soon realised that Louis was pining for those distant shores and the stage and eventually agreed to allow him to set off touring once again. Quickly the show was unpacked from the attic & storeroom and by 1878 we find he and his wife back in Capetown. He began his shows on November 5th and continued with undiminished success. The journeys through South Africa were notoriously difficult especially to places like Kimberley and the Transvaal that had attracted thousands of gold and diamond miners with the prospect of good houses in often primitive halls and open air stages. The terrain was rough, inhospitable with deserts, hills, mountains and flooded rivers that his twelve oxen carrying his equipment struggled to make headway. Eventually he increased the oxen to 36. Crossing the Orange River, he almost lost his whole travelling show in the mud that resulted after heavy rains but saved by the efforts of the resourceful Africans. One has to admire the spirit and determination of these early pioneer entertainers who brought their shows to difficult and remote destinations. After showing successfully in Port Elizabeth and Pietermaritzburg, Louis off loaded some of his unwanted trunks and equipment and set sail for Australia and New Zealand once again. After further success in Australasia, he set off for the Dutch East Indies, staying in Java for nearly 9 months. He toured Siam, much of China and Japan, then returned to the British East Indies and pushed forward to Delhi then onto Calcutta (Now Kolkata). Having contracted malaria, Haslemayer’s health began to decline. On March 6th 1884, he gave his last performance in Calcutta that ended his incredible career. He returned to Vienna via Egypt to rest after his strenuous exertions travelling. His health continued to decline and sadly he passed away on April 19th 1885 with a lung infection. Constantly seeking new, different materials for one’s act is essential for success, and Haselmayer certainly was one who believed in this. 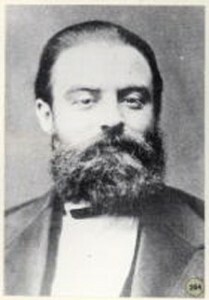 Multi-talented and skilled, Louis Haselmayer is regarded as one of the unique and highly acclaimed performers in the history of magic.